ArtAbled is a unique, inclusive platform which brings together people with disability and other individuals for art, knowledge sharing, interactions and fun. Product Sale/Exhibition- Various products made by people with disability such as paintings, ear rings, pouches, bags and so on. Step towards Inclusiveness- An exclusive session for employers to create awareness on the disability sector and sensitisation towards people with disability, leading to an inclusive office environment and job opportunities for people with disability (PwD). 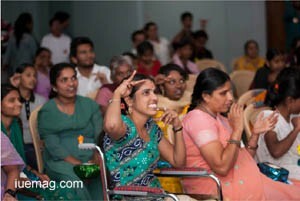 Through ArtAbled, the organisers intend to shift the focus on to possibilities from disabilities. Be there at Cheshire Disability Trust, Kodihalli from 3rd to 7th of Dec, 2014 to witness and be a part of the inclusive carnival. *GiftAbled Foundation is a non-profit initiative which strives to create an ecosystem of like-minded individuals to form a sensitised and disabled friendly society, through gifts for differently-abled, workshops on Awareness and sensitisation towards People with Disabilities (PwD), Special Clubs for Deaf and Blind and ‘hatke’ inclusive events. Any facts, figures or references stated here are made by the author & don't reflect the endorsement of iU at all times unless otherwise drafted by official staff at iU. This article was first published here on 28th November 2014.